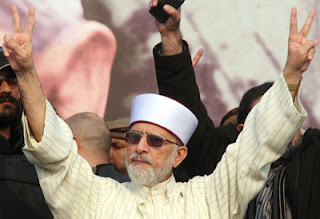 Long March of Minhaj Ul Quran leaded by Dr Tahir Ul Qadri entered Capital Islamabad on Monday evening which started its Journey from Lahore on Sunday afternoon. According to media reports there are around 40000 people in the Long march. thousands of Buses and Cars have reached Islamabad going through different cities of the Pakistan where people continued to join the march. Thousands of people are already present at the Blue Area of Islamabad to welcome the long march. Massive security arrangements are also done keeping security risks in mind. all the people are having flags of Pakistan instead of any party flags and raising slogans for the change. People have said that they will not go anywhere until the present Corrupt Government goes away. Most of people have also brought important things of need like food, dresses with themselves which means they are ready to stay In Islamabad for several days. Next 2 days will be important and we can expect anything during this time.